We’re hearing a big argument today – it’s not a debate but a very primitive, emotional argument – about who will next lead this nation. Who will make America great again? Who will lead us to manifest the greatness we already possess? Who will lead the social and political revolution that restores our basic values? It’s a very old story. Two thousand years ago the people of Israel were looking for a messiah, someone to rid their country of the oppressive Roman occupation and restore the glory and security they had known in previous generations. They were looking for the one whom God had promised, the one who would save them. They had been hearing about Jesus of Nazareth and the things he had done, signs that he might be the one they were waiting for. But they had doubts. He said the kingdom of God was near but gave no hint that he was ready to lead the revolt against the Romans. He claimed and did things reserved for the end time, but his time was looking less like the end time and more like the ordinary time they had known all along. So they put him on the spot. “How long will you keep us in suspense?” they wanted to know. “If you are the Messiah, tell us plainly” (John 10:24). Give us the evidence we seek. Show us the money. But Jesus would not play their game. He did not give them what they asked for. He did not prove his identity in ways they desired or would even recognize. They thought in terms of power; he spoke of weakness. They thought in terms of victory over the enemy; he spoke of loving the enemy. They wanted a plan for revolution; he called them to a revolutionary new way of living in their present circumstances. They wanted to protect their nation’s borders; he spoke of welcoming the stranger and sojourner. They looked for a kingdom in the future that would come on clouds in great glory; he spoke of a kingdom already spread upon the earth, so ordinary it was unseen by all but a few. What do you look for in a messiah? Someone who will deliver you to a better life after this one is over? A cosmic protector from the perils of this world? Someone to make life easier, the road smoother? There have been many understandings of Christ offered through the centuries, and we haven’t seen the end of them. But there’s a twist on that question that’s more appropriate: What do people expect of us as the church, of us who are the body of Christ today? Some people look to us only for money and what it can buy: bus fare or gas for the car, help with the rent and utilities, food from the food pantry, and some of them get those things, thinking they’ve getting the best of what we have to offer. Others look for entertainment or affirmation or to have their emotional batteries recharged each week. They expect the church to meet their needs and the needs of their families as they sit passively, consuming the service and evaluating the worth of what they’re served. They’re burdened with the mistaken notion that we’re in the customer service business, forgetting – or perhaps they never heard – that we’re not here to serve our members but to transform people and make disciples who will transform the world. Consumer religion has hijacked the church for so long, some people don’t know there’s anything more to it than that. It’s no wonder the mainstream church in this part of the world is in severe decline. People aren’t looking for those things, so they’re staying away from us in droves. What do people really seek from the church? What do they seek that only the living body of Christ can offer? What can we give that no one else can offer but that everyone is hungry for? Tabitha, the simple seamstress from Joppa, may have the answer. Tabitha “was devoted to good works and acts of charity” (Acts 9:36). And then she fell ill and died, and the community mourned her loss. 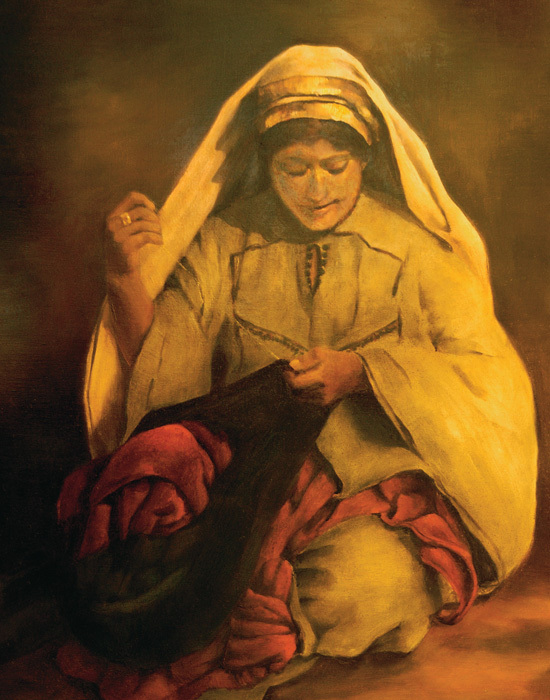 When Peter arrived, they showed him all the good things she had done, the clothing she had made for love of others. Many people had been touched by her life, and many were also touched by her death. It would be a big funeral. But Peter sent them all outside. He knelt down and prayed, and then he turned to the body and said, “Tabitha, get up,” and she got up. And the story “became known throughout Joppa, and many believed in the Lord” (v. 42). Because of her good works, Tabitha’s death was mourned by those who knew her. Good works are important, essential; without them, James writes, our faith is dead (James 2:14-17). But Tabitha is remembered not for her good works but because of the new life into which she was raised. And it’s not because of her good works but because of her new life that many came to believe in the Lord. What do our neighbors look for from you and me? Our good works are important. Jesus tells us that in the end the worth of our lives will be found in how we feed the hungry, shelter the homeless, clothe the naked, care for the sick and those in prison, and welcome the stranger (Matt. 25:31-46). Yet our good works are not what make us the church. What makes us the body of Christ is the transformed and transforming quality of life we express. What matters is the hope our way of living provides to the forgotten people who struggle at the fringe of our communities and at the edge of our consciousness. What matters is that we step free of the tombs that have held us too long – tombs of habit and ease, of prejudice and limited vision, of self-service and personal security – and present ourselves to the world around us as the free and whole people God has created us to be. What we and the people around us are looking for in this election year or any year is not the right leader who will embody our hopes and aspirations. What the world is looking for is the transformed and transforming life you and I have to offer. It needs us to stop singing about resurrection during Easter and start living resurrected lives all the time. During the next few weeks I’ll share some thoughts about how we might do that.